Small volumes of anti-ARF1 antibody vial(s) may occasionally become entrapped in the seal of the product vial during shipment and storage. If necessary, briefly centrifuge the vial on a tabletop centrifuge to dislodge any liquid in the container`s cap. Certain products may require to ship with dry ice and additional dry ice fee may apply. 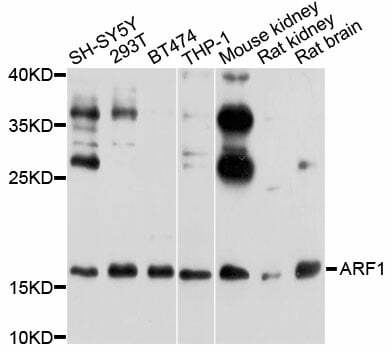 Western blot analysis of extracts of various cell lines, using ARF1 antibody. GTP-binding protein involved in protein trafficking among different compartments. Modulates vesicle budding and uncoating within the Golgi complex. Deactivation induces the redistribution of the entire Golgi complex to the endoplasmic reticulum, suggesting a crucial role in protein trafficking. In its GTP-bound form, its triggers the association with coat proteins with the Golgi membrane. The hydrolysis of ARF1-bound GTP, which is mediated by ARFGAPs proteins, is required for dissociation of coat proteins from Golgi membranes and vesicles. The GTP-bound form interacts with PICK1 to limit PICK1-mediated inhibition of Arp2/3 complex activity; the function is linked to AMPA receptor (AMPAR) trafficking, regulation of synaptic plasicity of excitatory synapses and spine shrinkage during long-term depression (LTD). (Microbial infection) Functions as an allosteric activator of the cholera toxin catalytic subunit, an ADP-ribosyltransferase. 1. Coincident with the loss of PICK1 by GBF1-activated ARF1, CDC42 recruitment leads to the activation of IRSp53 and the ARP2/3 complex, resulting in a burst of F-actin polymerisation potentially powering scission.